As we get ready for finals, each day we’ll feature some of the lesser-known study spaces in the Jerome Library. Floors 2 through 5 house our Special Collections, but can also be great places to study, away from the crowds! What do Katniss Everdeen, Winnie the Pooh, and Jackie Robinson all have in common? They’re all characters in books available at the Curriculum Resource Center! And if studying has got you down this Finals Week, why not treat yourself to reading The Hunger Games, Finding Winnie, or Jackie’s Bat? And while you’re picking up a copy at the CRC, why not stay to study? The Curriculum Resource Center is the ideal place to tuck away and study during Finals Week. In addition to many group study tables, we have an entire classroom, Room 210B, at your disposal (just check the schedule posted outside to see if it’s available). A few of our tables are even tucked away from foot traffic if you really desire a quiet place to work. As an added bonus, you’ll be surrounded by children’s and young adult literature, games, classroom activities, puppets, die-cut machines, and other charming distractions for when your brain is full and you need a break. Expand your study space and study away from the crowd. Although Room 210B and the teaching aids shutter up by 10:00 PM, the CRC’s main floor closes when the library closes – which is pretty much never during Finals Week. Come visit us. Even if it’s just to say “hi” or check out a great children’s book. Need extra time to work on papers and exams? Have your own special spot in the library where you like to study? Need access to books and other library resources? The University Libraries extends its hours of operation (24-5 Sunday through Thursday) beginning Sunday, December 3 to provide a safe and comfortable research and study environment free of disruption for our students, staff, and faculty. Important reminder: Circulation services as well as access to our laptops, headphones, and reserve materials will be available until 2:00 am. Library patrons will have access to the 1st, 2nd, 7th and 8th floors throughout the night. Campus Police will be stationed in the library throughout the night to ensure student safety. The Wm. T. Jerome Library offers more than 200 computers, quiet study space throughout the building, and a variety of collaborative group study locations. To reserve a group study space, click here. For more information about our hours, visit http://ul2.bgsu.edu/hours. Best of luck to everyone on their finals! 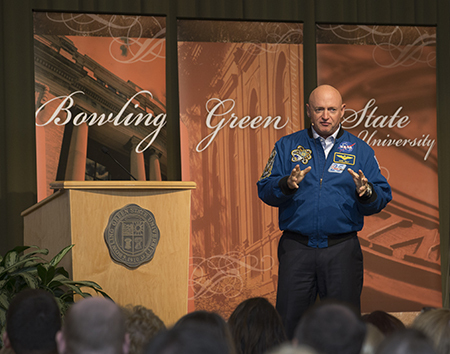 As part of events commemorating its 50th anniversary celebration, University Libraries hosted astronaut and author Mark Kelly to headline the Ordinary People, Extraordinary Stories lecture series this fall. The former Navy officer and NASA astronaut shared his experiences through witty and moving tales to a crowd of several hundred enthusiastic listeners. Kelly has been to space a total of four times, the first two aboard the STS-108 Endeavour and STS-121 Discovery. Kelly didn’t give up, though, and redoubled his efforts. “How good you are at the beginning of something isn’t an indicator of how well you’ll do later,” Kelly said. One of the first points Kelly expanded upon was that there was never an excuse for not communicating with teammates, describing one event in particular where he didn’t properly communicate with a pilot he was working with during a combat mission over Iraq, which very nearly resulted in getting both him and his partner killed. Kelly also spoke candidly about wife Gabrielle Giffords, a former U.S. congresswoman who shot outside a Tuscon supermarket in 2011 while meeting with constituents. While she survived being shot in the head, Giffords now has aphasia – a language disorder resulting from brain injury that leaves its victims with the loss of ability to comprehend or express speech properly. “It was a learning experience for both of us in terms of patience, and in terms of decision making,” Kelly said of his wife’s shooting and subsequent recovery. In another moving story, Kelly explained how after Giffords was shot, the doctors needed to perform surgery and repair parts of her skull, and decided to change the way they did the procedure the day before it was scheduled to happen, which led to Kelly questioning how group decisions are made and what the best course of action would be – something he has carried into his career and how he makes safety decisions for his own crew. Kelly’s last words of advice were from his wife. This past spring, Visual Communication Technology student Linda Peralez stopped by the Ray & Pat Browne Library for Popular Culture Studies to film a short documentary. Featuring Head Librarian Nancy Down and Manuscripts & Outreach Archivist Steve Ammidown as well as Department of Popular Culture Lecturer Dr. Charles Coletta, this documentary gives a brief history of the library as well as a glimpse inside its amazing and eclectic collections. Take a peek, and then come see for yourself! A special thanks to Linda Peralez for allowing us to share her excellent work with you. University Libraries is offering Individual Research Appointments (IRAs) to students. IRAs provide students with the opportunity to work one-on-one with a librarian on a specific research assignment. Students will develop search strategies, identify various print and electronic resources and discover services available in the University Libraries. IRAs are designed for undergraduate students. (The Libraries offer a similar service for graduate students. Call 2-6943 or stop by the Research & Information Desk for more information.) Students must sign up for appointments by midnight of the day before the requested appointment date to allow for preparation. Students must also have a specific assignment or project and will be asked to state their topic when setting up their appointment. IRAs are offered Monday-Friday. To schedule an appointment, call 419-372-6943, or stop by the Research & Information Desk on the first floor of the Jerome Library. The Library and Learning Commons would like to invite all students to join us at the main entrance of the Wm. T. Jerome Library for our annual Fall Welcome Event on Thursday, August 31 from 2-4pm. BGSU Athletics will also be here providing falcon swag. See you then! Join us as we celebrate 50 years of the William T. Jerome Library on the BGSU campus. A celebratory event will take place on Friday, Nov. 3, from 4-5:30 p.m. on the first floor of the library. Presentations on the William T. Jerome Library mural and the library as the academic heart of campus will begin at 4:15 p.m. followed by library tours and refreshments. To RSVP, email libadmin@bgsu.edu. As part of our 50th anniversary celebration, the University Libraries will host astronaut and author Mark Kelly for its Ordinary People, Extraordinary Stories lecture series on Tuesday, Oct. 24, 2017. With an extraordinary career of service to our military, our nation and humanity, Kelly has secured his place in history as a role model, modern-day pioneer and leader of distinction. Together with his identical twin brother, Scott, he has laid the groundwork for the future of space exploration as the subjects of an unprecedented NASA study on how space affects the human body. Kelly is known for captivating audiences with lessons learned from his extensive travels and experiences in the Navy, outer space and on the ground. From leading teams in some of the most dynamic environments imaginable, to the thrill of spaceflight, and the recovery and resilience of his wife Gabrielle Giffords, he will reveal what he believes are the foundations for success to accomplish your mission in life and work. Tickets for the event are free, but an RSVP is required. Guests who are interested in meeting Captain Kelly can attend the VIP reception prior to the event. For more details, visit the event webpage. We’re open until 2:00 am Sunday through Thursday. A complete list of our hours can be located here. Perhaps instead of coming into the library, you prefer to research from the comfort of your room. Library resources are available from any computer with a current BGSU ID. We have numerous places for quiet and group study, including the 1st, 2nd, 7th, and 8th floors. In addition, Thinkers@Outtakes is open. Make an appointment with a librarian for an individual research appointment. Let us know what you are working on and we can pull resources ahead of time. Call 419-372-6943 or 866-542-2478 to speak with the Research & Information Desk. Librarians can meet with faculty for research assistance tailored for their class. For more information click, here. If you have any questions about how to use library services or collections, please ask one of the University Libraries staff or librarians who are eager to serve you. We’re also available via email, instant message, chat, and phone. We look forward to working with you and helping you with all of your library service and research needs. Libraries used to be known strictly as places of silence because talking could interrupt the learning process of the students around you. Now, talking is actually encouraged in certain parts of the library, especially at the future home of Bowling Green State University’s Collab Lab in the Jerome Library. The Collab Lab will be a hands-on, creative space for students, faculty, staff and community members to engage in collaborative work. Its goal will be to support teams of innovators working together to conceive, create, develop and refine new products and services that leverage the unique talents inherent to the University community. The lab, an easily accessible 2,000-square-foot facility, will have a director, Dr. Jerry Schnepp, and a support staff, along with rapid prototyping tools such as 3-D printers and scanners, a green-screen video studio with voice-over capabilities for video production, and whiteboards. The space will take over the current Student Technology Assistance Center (STAC) but retain its existing services, which includes peer-to instruction on a variety of software applications for undergraduate, graduate and distance students. Digital equipment rental also will still be available. STAC will move to a temporary space on the first floor of the Library while construction commences on the new Collab Lab over the summer. With the new Collab Lab, Schnepp hopes to attract some of the University’s most creative types, both students and faculty. Ogawa, Schnepp and University Libraries Dean Sara Bushong toured other universities with similar labs, including Harvard, Case Western Reserve and Wisconsin-Milwaukee. They imagine the possibilities for BGSU’s Collab Lab, which they hope to roll out with an opening during the fall 2017 semester. Plus, having the Collab Lab in the library is a natural fit. Just call it the ongoing evolution of BGSU’s Library Services. “It’s always been our job to give students and faculty what they need to be successful. The Collab Lab fits well in that philosophy,” Bushong said.